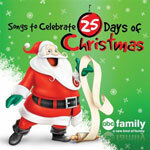 CD review: "Songs to Celebrate 25 Days of Christmas"
Designed as a promo to publicize this year's holiday schedule on Disney subsidiary ABC Family cable channel, the 16 songs here are all drawn from movies or specials airing between Thanksgiving and Christmas. Despite the hokey nature, it's not a bad collection  taking in everything from Bing Crosby and Andy Williams to Hillary Duff and Simple Plan, meaning everyone from the kids to grandma will like something on here. The songs progress from the lightest, fluffiest pop, tracks by actresses Alexa Vega and Amber Stevens, from the new made-for-TV movie "Santa Baby 2: Christmas Maybe," through Simple Plan and new-swing by the Brian Setzer Orchestra and Big Bad Voodoo Daddy, to classic pop by Williams and Crosby, and jazz by Ella Fitzgerald. Among the treats are songs from long-running animated Christmas specials, "Frosty the Snowman" (the theme song performed by Jimmy Durante) and "Santa Claus Is Comin' to Town" ("Put One Foot in Front of the Other," by Mickey Rooney and Fred Astaire).